It was tough to say goodbye to Chiang Mai because the city became our home away from home. But we had to continue our journey since we made plans to visit Bangkok before heading to Cambodia. Since we had a pleasant ride from Surat Thani to Bangkok, we decided to try the overnight train to Bangkok. Apparently, this segment is the most popular route in Thailand, and the trains are newer. 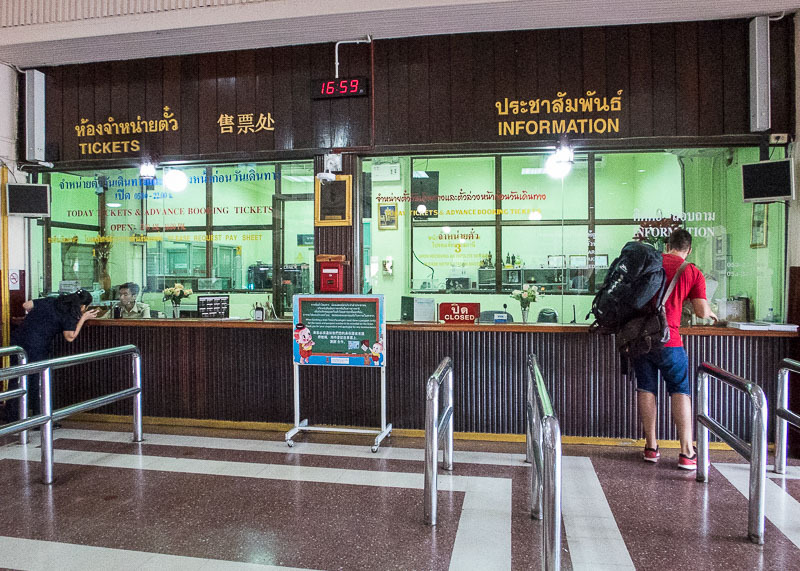 Read this post to get a feel for what you can expect at the Chiang Mai train station. 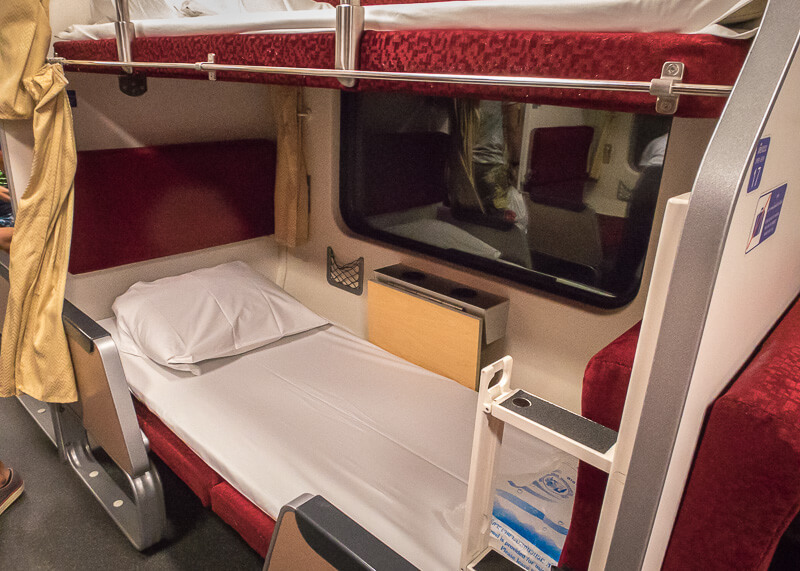 Option 1: First class sleepers consists of private two-berth compartments. You would have a little sink in your room and a lock to barricade yourself inside the berth (that’s no fun!). 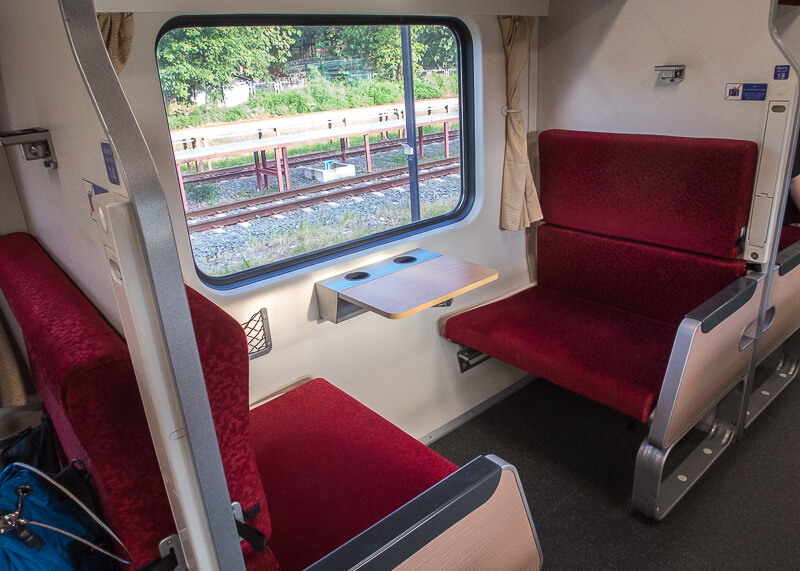 Option 2: The setup for the second class sleepers are in an open space concept. You share the sinks and toilets with the rest of the passengers, and the price is lower compared to option one. We paid 941 baht for the upper berth and 1041 baht for the lower berth. For some reason, the lower berths tend to be pricier. You do get more room on the bottom berth though. We went with the second-class sleepers for this route. You can either book the tickets in person at the station, online, or on 12go.Asia. The latter takes care of everything and makes arrangements for you to pick up the tickets from them. If you want to save money and you know your route, you can try to book directly with the Thai railway website. All you need to do is create an account, select a train, and use your credit card for payment. You get your ticket via email where you can print and bring with you on the day of travel. Since Chiang Mai is a very compact city and it only takes 15 minutes to get to the station, we arrived at the station an hour before departure. Our ride to the train station by Songthaew was 120 baht, which is weird because the same trip would have cost us 150 baht if we took a Tuk Tuk. I will never understand Thailand’s pricing model. Meh. After a very short wait at the Chiang Mai train station, it was time to board our train! They looked not more than a year-old. 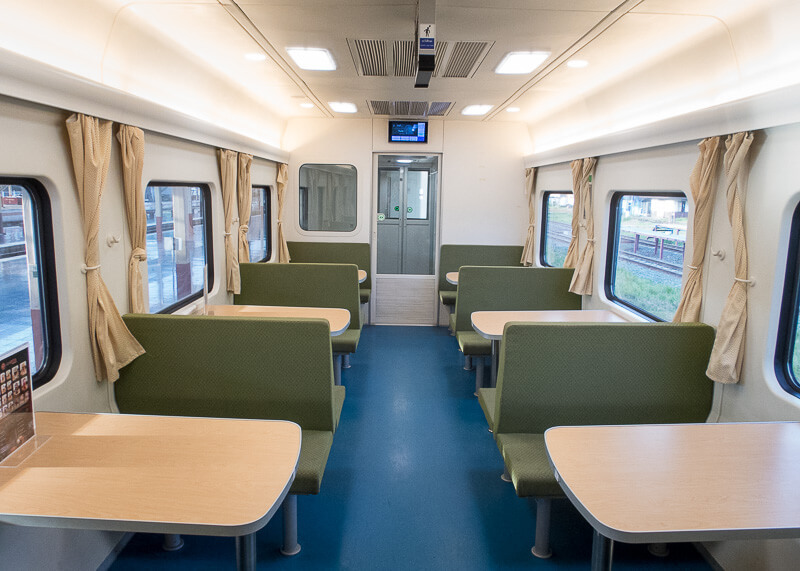 The washrooms are clean and new, and there are power outlets for each passenger! Yay! Once our train started moving, staff members came by to check everyone’s tickets. Most were armed with weapons. You couldn’t hear much noise outside, and the air conditioning wasn’t too cold. Gary for some reason always needs to eat on the train, so he ordered a rice and beef dish for 60 baht. The portions were smaller than you’d expect outside of the train, but the food was still good. The views from the window were spectacular. Sometimes I forget about the beautiful jungles, mountains and hill tribes that surround Chiang Mai. The ride is very scenic and changes from rice fields to sugar canes. Every so often, I’d see a motorbike make his/her way home. What’s it like to get ready for bed? People started asking to have their beds set up right after dinner. By 7:30 pm, most people already had their beds made and were tucked away in their little area. Once I had my bed set up, I hid behind the curtains to change into PJs. What’s it like to sleep on the train? I was exhausted for some reason, so I passed out at 8:30 pm. Unfortunately, I woke up at 10:30 pm and could not go back to sleep. While Gary can sleep well on the train, I struggle to sleep because the train makes frequent stops. As well, most stops come with loud announcements over the speaker. People often get on and off the train, making the atmosphere noisier. Again, I am a very light sleeper, and Gary’s experience is the complete opposite of mine. It gets noisier as the train inches closer to Bangkok. People start to wake up, chatter, and there’s just a lot happening all at once. 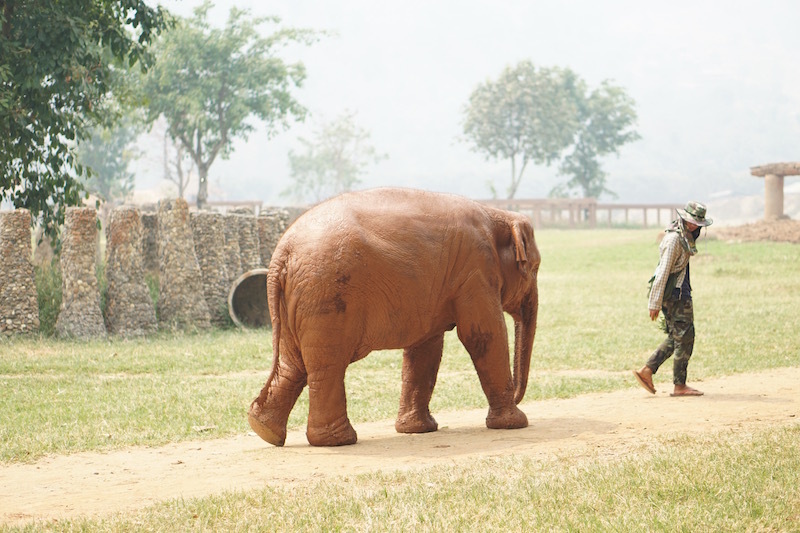 Once you’re about 45 minutes away from Bangkok, staff members will come by to wake you up and put away your bed. The train into Bangkok is eye-opening. You go through the backyards of people’s homes, with rooftops made of sheet metals. Sometimes the train looks like it’s about two inches away from touching their roof. 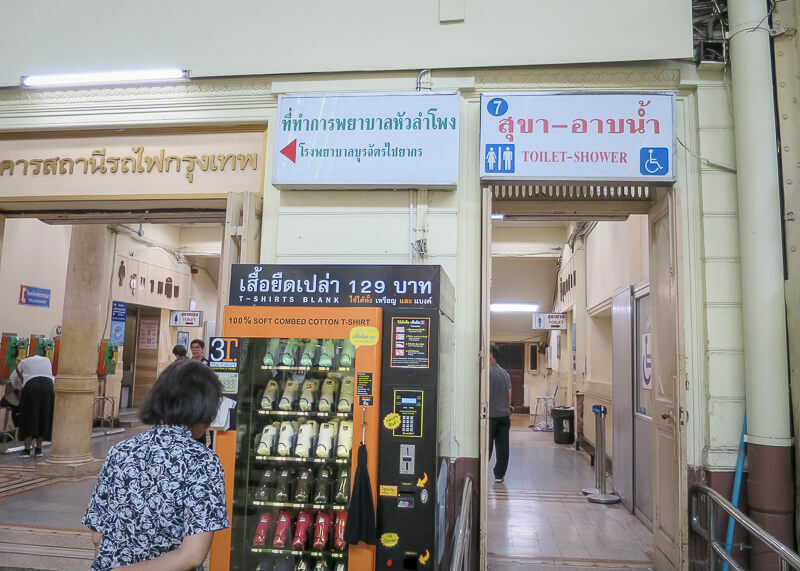 When we arrived at the Hua Lamphong station in Bangkok, we decided to use the bathroom since it might take over an hour for us to get to our hotel. I line up for the women’s bathroom, and it was chaotic. All the people who just got off the train were brushing their teeth and freshening up after a long journey. The men’s bathroom is down, so there are men too, adding to the chaos. I saw a huge cockroach running across the floor while waiting in line. It’s common to see them in Thailand so I can’t say I was surprised to see them in the bathroom. So I stood there minding my own business when I felt something at my feet. I looked down to see that of all legs in the bathroom, the cockroach decided to climb up on my leg! Mine! Of course, I screamed as loud as I could to get rid of the cockroach, and everyone (who is Thai btw!) gave me the funniest look, as if to say has a cockroach never crawled up your leg before? Yes, why yes, they have crawled up my leg and into my pants. Tiny ones that left me screaming just as loud as I was screaming at that moment. Did I feel safe on the train? The train ride felt very safe. I was a bit anxious about overnight train travel at first. 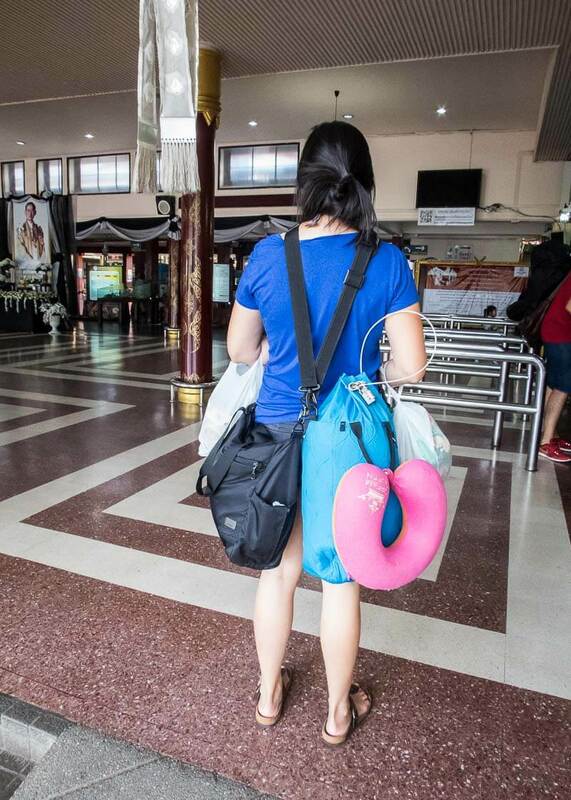 But after this experience, I’m not nervous about travelling via train in Thailand. Yes! 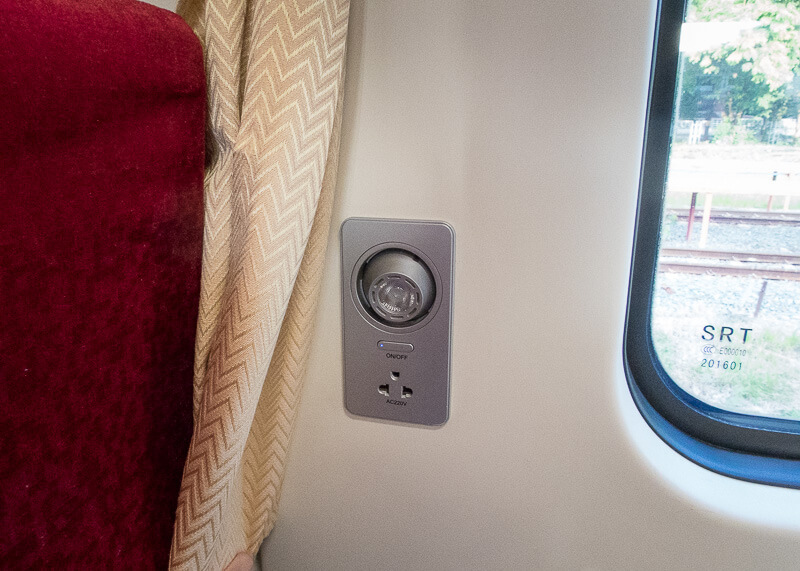 Unlike the other train sections where you couldn’t charge your phone, this train has a charging outlet beside every bed! Is it easy to ask questions in English? 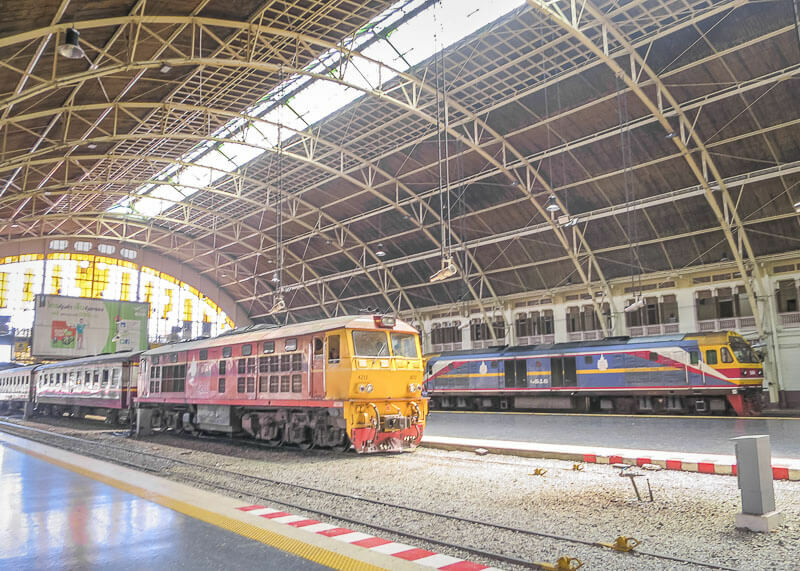 Asking questions in English is simple, and the staff members make sure to give you ample warning once the train was getting closer to Bangkok. Is there food on the train? 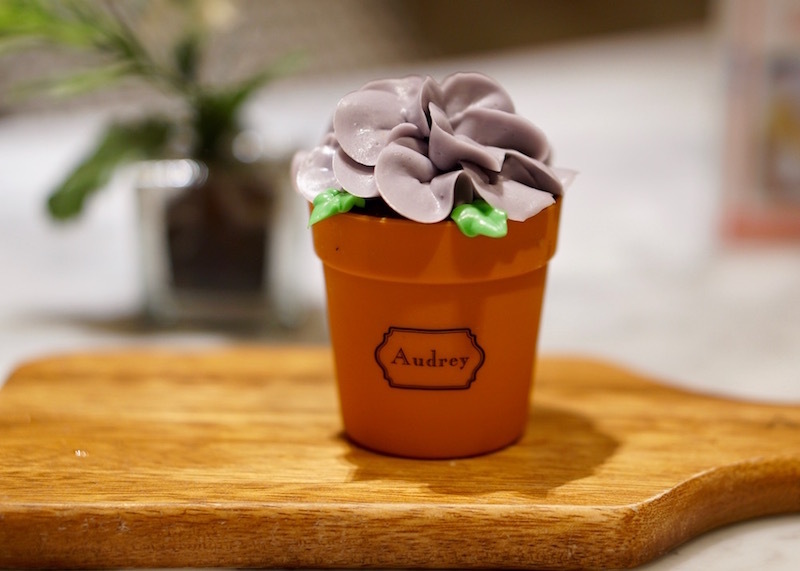 You can order food in the restaurant or wait until a staff member walks by with a menu. If you order from the staff member, he or she will bring the food to you and ask for payment before handing over your dish. 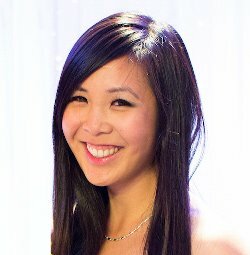 Where to keep luggage and storage options? If you have a carryon, you can store your bags underneath the bed. If you have a large suitcase like us, there is room to store your stuff at the end of the carrier. What were the facilities like on the train? The toilets and wash area are the cleanest of all the train travel I’d done in Thailand. There’s always toilet paper, and there is a regular toilet and squat toilet. I would caution brushing your teeth with train water though. What to wear on the train? I usually show up in shorts and change into leggings, a hoodie and a t-shirt for bedtime. The train can get very cold, so it’s nice to have a sweater over my t-shirt. Any other tips for taking the train? Bring water if you want to brush your teeth, or skip brushing your teeth. It’s just one night anyway! 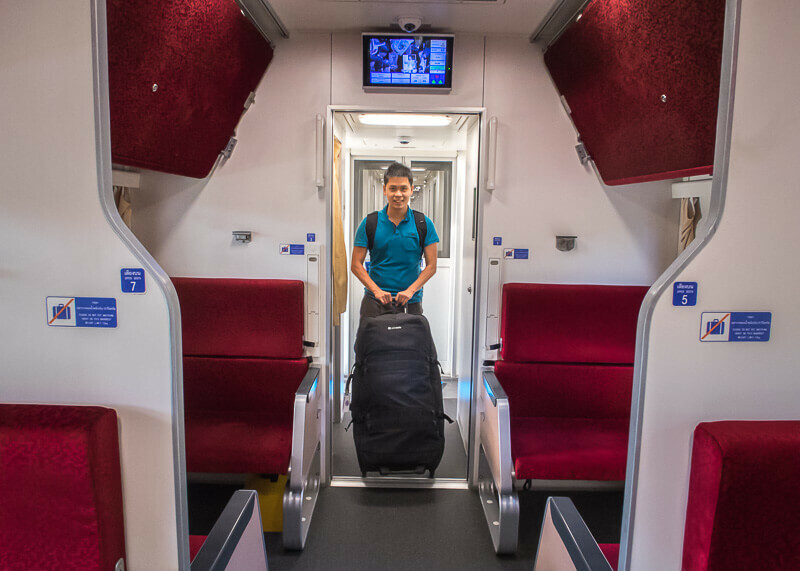 Have you travelled via train in Thailand before? Share your experiences in the comments below! Nice breakdown Nancy. I’ve not done the train but it looks nice. We used to bus between CM and BKK; now we just fly to save time. Amazing too; flying with Air Asia is so cheap, the cost of this puddle jump is not too too much more than a bus ticket. Slow travel wise methinks the train is definitely the way to go. Thanks for this detailed information. 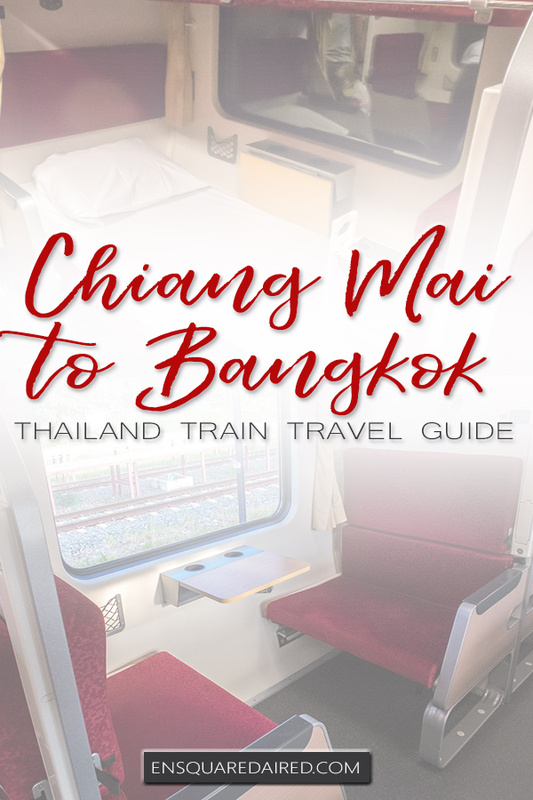 My friend and I are looking for a train ride from Chiang Mai to BKK too. May I ask which train no did you take? Is it 10? Thanks. Thanks so much for your comment and I am glad this post helped you! Yes, we took train number 10, which left Chiang Mai at 18:00 and arrived at 6:50 am in Bangkok. Hopefully, the train number hasn’t changed (likely not!) but it’s always a good idea to double check just to be safe. 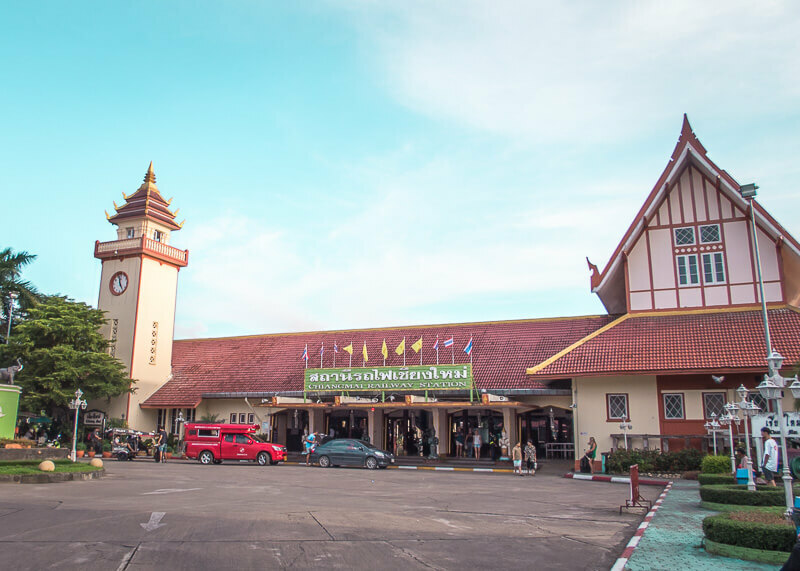 I wrote a post about the Chiang Mai train station which I forgot to link into this post. You might find it helpful while planning the logistics. The most important thing is that there is a 7-eleven across the street and you should totally load up on snacks before you get on the train!